When your roof leaks there is only one choice. That being Liquid EPDM Rubber. With a 25 year history on the market it has proven over and over again to be the #1 choice for our customers. Since this is the only Liquid EPDM rubber in the world it has some very impressive characteristics as you will see outlined below. 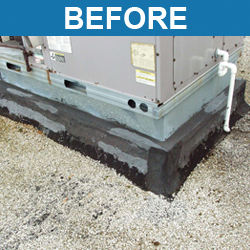 We have used EPDM coatings for about four years to date and enjoy that we do not need to be technicians to do it fairly well... It goes on nicely and adheres where we want it and stops our leaks.. like right now.. Our flat roof was a mess.. old and not doing well... We repaired a few boards and then closed up the surfaces with the Poly Fabric and butyl tapes... Love them all.. Liquid rubber is the best for our purposes down deep in Texas heat, sun, rain and wind.. It all went on well and continues to stop the leaks and gives us a good looking surface to look at.. Thinking of more places to use this product.. Thank you EPDM..
Lou, Thanks for the instructions. I did call the sales staff again for more info on some more questions I had, which I received polite and good answers making the decision to brush your product on B Deck the only option. While it is a task in doing so, even for a 300 square foot area the instruction covered all aspects of the applications including time and texture of product. lol I'm now waiting for full cure to continue to project and wanted to let you know it looks great and will make a great barrier as per design. Agriculture - dams, irrigation channels, viaducts and levees. Anti-abrasive - augers, piping, pilings, and pylons. Automotive - corrosion, vehicle areas prone to noise or vibration. Building industry - commercial and residential, between slabs, basement walls, tanking, foundation, roofing, planter boxes, internal wet areas, balconies, and terraces. Civil work - tunnels, bridges, dams and reservoirs. Environmental - landfills, erosion control, methane gas barriers and linings. Industrial - acid pits, wash bays and secondary liners. Mining open cut - hepa leach pads and tailing ponds. Mining underground - rock seam stabilization, controlling seepage and gas emissions in shafts. Protective - shipping containers and other aggressive situations. 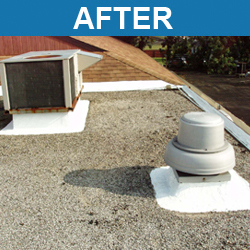 Roofing - new and retrofit construction. Sewage - pipe re-lining and water treatment plants. Vapor & Termite Barriers - housing and other slab underlay.